Lens Description: Reminiscent of classic 20th century lenses, the Nikon F mount Velvet 56mm f/1.6 Lens from Lensbaby produces a uniquely soft, glowing image quality that is well-suited to making expressive and ethereal portraits. The overall softness can be controlled by stopping down the lens while still retaining the smooth tonality of a soft focus lens. Compatible with FX image sensors, this slightly longer-than-normal focal length pairs with the fast f/1.6 maximum aperture to excel in difficult lighting and achieve a shallow depth of field with controllable sharpness. Additionally, for increased creative versatility, the lens also offers a 1:2 maximum magnification and a minimum working distance of 5" for macro shooting. Housed within a black metal barrel, this lens also features smooth, dampened manual focus control to further benefit creative flexibility. 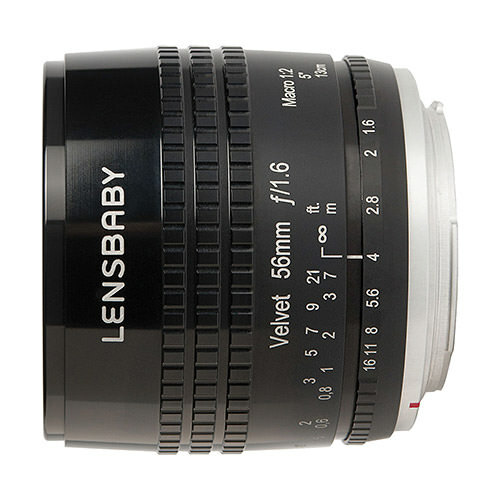 Consistent with Lensbaby's aim of purveying selective focus capabilities and a unique velvety image quality, the Velvet 56mm f/1.6 is a versatile tool that marries classical looks with contemporary control.